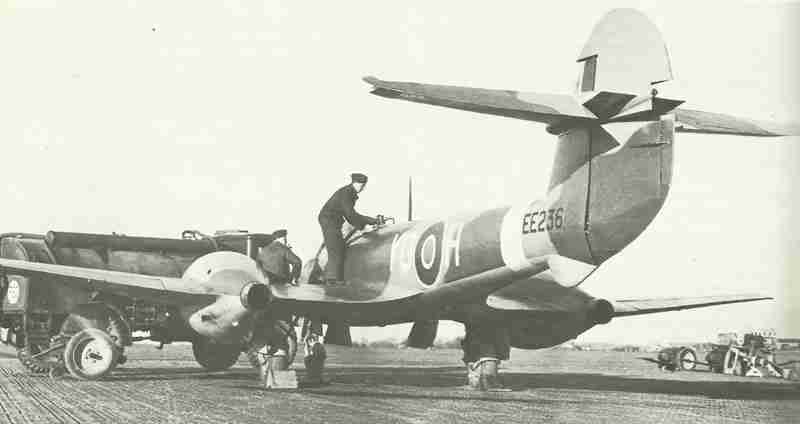 The first jet fighter of the RAF is also the only one of the Allies, which saw service in WW2; the twin-engined Gloster Meteor of the 616th Squadron of the 2nd Tactical Air Force. British 2nd Army tanks reach Villers Bocage, for second time since ‘D-Day’. Gloster Meteor jet fighter in combat debut against V-1s. South African units of British 8th Army reach outskirts of Florence. President Ryti resigns; Mannerheim takes over and forms ‘peace’ government. XP-47J Thunderbolt experi­mental fighter aircraft attains 811 km/hour in level flight. German E-boats fire T3D Dackel (‘Dachshund’) long-range torpedoes at shipping in Seine Bay (on 5 nights in August); only 2 ships hit. The 1943 Gloster Meteor was the world’s first¹ operational jet fighter.